The Highest House on the Mountain received its premiere in 1960 by Orion productions at the Dublin International Theatre Festival. It couldn’t be much further removed from the windswept and isolated rural setting of the play itself, but that fact serves to emphasise that John B. Keane’s work had nationwide appeal that preceded his native Kerry home. This appeal owed simply to the fact that Keane was as gifted and as pure a story-teller as was known in Ireland. Fifty years later, one of his greatly underappreciated works is being staged in Smock Alley theatre. Tavistock Arts assembled a young and extremely capable cast, including debutants such as Dave Curry and award winning Geoff O’Keefe (Michael McLiommoir Best Male Actor award for Billy Reddin International Dublin Gay Theatre Festival 2010.) O’Keefe turns in an excellent performance as Mikey, the widowed head of the household based in rural south-west Ireland. O’Keefe is spot-on with accent and mannerisms of his character and is hugely comical and also moving as a father who loses his wife and will also lose far more. The Highest House… comments and delves into the framework of the family unit, including roles and hierarchy. Mikey and Sonny’s existence is suddenly altered by the return from England by Mikey’s son Patrick and his new wife, Julie, excellently played by Eimear Kenny. The play centres on the existence of family and personal secrets and the public and private edifice which family members portray. These hidden lives and false fronts vie with the true reality of the character’s personalities. Sonny retreats to a hermit like existence in face of the church and family and seeks solace in the unassuming and simple mountain folk. Mikey, following the death of his wife, humorously focuses his passions on other means of satisfaction, notably chops and black pudding. Connie, Mikey’s rogue son enters the fray seeking to break the hatred of him by his father and in turn seek his share of the family farm. With Connie’s return comes also the outing of the deep and terrible secrets of each character’s past. Each has personal shame and Connie exploits these with threats and violence. As Patrick, Julie and Sonny all fall foul of their past, blame is apportioned to who brought this plague upon the household. Death proves to be the ultimate conclusion for many and cleanses all of their sins. Keane, however, also writes of forgiveness and the ability to overlook past flaws for the good of the soul and the god of the family. The work is an interesting commentary on the mindset of the Irish community and its predetermination on land, land owing, wealth and family. The desire for wealth leads many to their moral and physical destruction and their eventual death. This of course has more than just simple relevance in today’s post-boom society. It strikes with more than just familiarity of the recent classic, The Last Days of a Reluctant Tyrant by Tom Murphy at the Abbey Theatre, which deals with a crumbling estate headed by an ailing matriarch undermined by a scheming and land-grabbing son. In the striking setting of the stone walled and galleried Boys School stage at Smock Alley, This is an opportunity to see a moving, humorous and at all times engaging story by one of Ireland’s master story tellers. 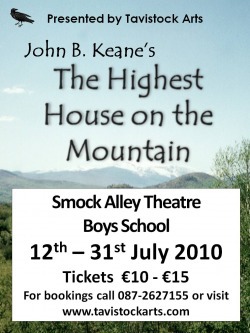 The Highest House on the Mountain runs at the Boys School in Smock Alley Theatre until 31 July 2010.